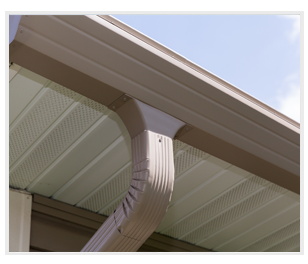 Superior Roofing & Siding provides premier seamless aluminum guttering. Superior Roofing & Siding specializes in residential and commercial applications. We are truly committed to providing the very best service to our customers. We treat every house as if it were our own, and use only the best materials available on the market today, at an affordable price. We roll form our aluminum gutters on-site. With access to over different 20 colors, we are confident that you will be able to find a gutter color to compliment your home. For starters, no seams means no leaks. This will help ensure that the water is carried away from your home which reduces excessive water infiltration around your foundation or into your basement. The design of our seamless gutters, also help maintain the integrity and strength of the gutter system so expansion, contraction, freezing and strong winds have little or no impact on our seamless steel gutters. Our gutters are custom cut on-site for an exact fit, making it blend perfectly with the soffit and fascia, enhancing the curb appeal and value of your home. Prevents wash out in flower beds and erosion around your home’s foundation. Increases the longevity of your roof by re-directing the flow of rain water. Except on the corners and downspouts, our gutters are seam free, meaning no leaks where traditional joints would be and minimal maintenance after installation. We use “hidden-hanger brackets” to fasten the gutter to the fascia, which are not noticeable from the ground. This makes for a clean, smooth look!